Until recently I had an adaptor which took many different countries’ power plugs in and converted it to fit into the Japanese sockets. The person I lent it to, however, neglected to give it back before returning to Germany which in turn ticked me off for a little while. I have, however, come to the point where all the electrical devices I use have Japanese plugs, so the loss of the adaptor is not so much a pain as an annoyance since I paid good money for it. As a side note, prior to that I also owned a big, green, round universal adaptor, the kind that accepts any country’s plug and can convert it into any other country’s plug. In that case though I forgot it and left it in Okinawa at the farm I was WWOOFing at. I hope that future international visitors there get good use out of it. 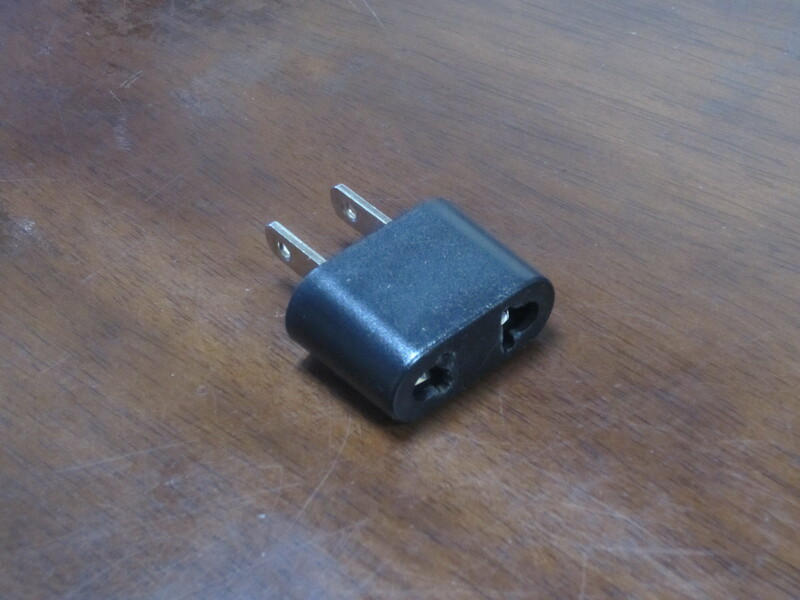 I bring all this up because my friend, Sand Dreamer, asked me if I would sell my single remaining adaptor, a simple one that would take an Australian or New Zealand plug (two sloping prongs) and convert it to fit in the Japanese sockets (two vertical prongs). As I mentioned I don’t currently need any adaptors but I did want to hold onto it just in case something came up and I needed it, I wouldn’t have to go out and find another one. I asked Sand Dreamer to let me think a bit about it, also saying that I couldn’t remember the cost. I think it was either 200 or 300 yen which is about $4. I gave it some thought and realised that I was holding onto it for a potential but improbable event need arose but otherwise it would just reside in my backpack unused. My friend needed it because his own chunky universal adaptor (the same type I left in Okinawa) was falling apart and he used it to power his laptop. His need was certainly greater than mine. Certainly he could have gone out and found something in Akihabara (this is Tokyo!) but that is besides the point I think. I had something which he could really use and it would even mean less useless crap being lugged around in my luggage, negligible though it may be. The only decision left was what price to sell it at. I really can’t remember if the cost was closer to two or to three hundred yen but then I realised that the difference was a mere 100 yen and agonising over it was a waste of brain energy. More than that though, the entire cost was small; why not just give it to him for free? It comes to me that the easiest and cleanest way to not worry about the price of something is to give it away for free. I can’t go giving everything away for free but this was definitely a good opportunity to do so. I don’t know what value Sand Dreamer will put on this whole affair but it’s worth something to me to make a gift of it. There is something that just leaves you feeling better when you give something away rather than sell it. It’s not about how much something costs. It can’t be measured in dollar terms. It is simply a gift or it is not. It reminds me of a lesson another friend, Ricardo, an American/Mexican, taught me when I was travelling in central Europe around Serbia & Montenegro. He noticed that when it game to giving and receiving I had a tendency to get hung up on keeping things even. At the time a chance-met backpacker was selling his hiking boots which were in mint condition. He’d just bought them but it turned out they were too small for him. They were a pretty sturdy pair of boots and the weather was turning cold and wet. Unfortunately, even though they were better than my boots, I too had just recently bought mine and I didn’t want to spend any more money. I decided not to buy them. As that backpacker was leaving the hostel dorm for the last time I awoke from my bunk and he said that I could just have the boots for free. He certainly didn’t want to carry the useless boots around in his backpack. Did I accept his gift? No. Rather than that, I offered him the little money I had on me at the time. I think I got the boots for around ten euros, an absolute steal, but that’s still a lot of money for a backpacker like me. Later Ricardo commented to me that my view of gift giving and receiving was different from his. When I gave a gift, maybe bought a friend a coffee, in the back of my mind I was making an entry into a log book, keeping track of who bought what and how much was spent, who owed who. I was giving with the expectation to receive. Not only that, I was receiving with the burden of reciprocating in kind. I think it has to do with how I was raised, it may be a bit of a Chinese cultural thing. Everything is kept balanced on the books. Favours. Gifts. Everything. Ricardo’s view was the complete opposite. When he gave he gave, he told me, he did so without the expectation of receiving something in return. He was backpacking like me and so was also tight with his money so he added that he didn’t just give anything away but that when he could afford to part with something he didn’t need then he would give freely. The corollary to this was that when he received he also received without burdening himself with some obligation to pay the person pack. When he was offered something he felt no need whatsoever to pay that person back. He received freely. In the case of the boots, Ricardo thought I should have taken them for free and not felt some vague sense of guilt about it. Later in my trip around Europe I realised that if I had taken those boots for free, then I would not have felt obliged to sell my original pair of boots and recoup some of the money I had paid for them. If I had received the boots for free I would have felt much more easily about giving my original boots away for free. Instead, I lugged them across the breadth of Europe looking for someone with the same boot size to sell it to. In the end I just left them in a hostel for free, without even a recipient in mind. It might be that the hostel staff just threw them out with the trash. I’m not sure how long it took for me to really understand this new concept but now it’s a concept I try to embrace fully whenever I can. The acts of giving and receiving haven’t changed but my way of thinking about them has. It’s liberating to not have to constantly keep some book of accounts in the back of my mind, to both give and receive without attaching any unnecessary mental and emotional baggage to those acts. It’s kind of like karma. Hopefully my giving away of gifts will have a ripple effect and flow on to the next person and the next and so on so forth. That’s a good enough reward for me.